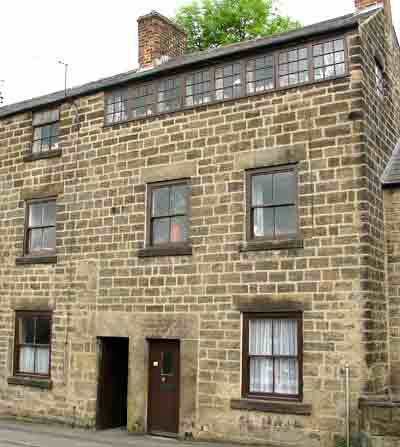 Royal Oak Cottages, one of a small row of cottages on the Common in Crich, is one of the best remaining examples of a stockinger's or framework knitters house. Here in 1851 lived Benjamin and Ellen Walker with their five children aged 5 - 16 years. There must have been many houses with families like this living in Crich at this time. The continuous rows of windows on the top floor of the house is the external sign that framework knitting was carried on inside. Behind these windows there would be a packed row of frames on which the framework knitters would work making cotton stockings. Sometimes the dividing wall between houses was removed from the entire length of a row of cottages at the upper floor level, in order to make room for more frames. The knitters had to work long hours to make enough stockings to earn enough to pay for the rent of the frames, the rent of their houses and buy food and clothing for their families. Very often all the family would work on the frames, with the younger children or old women being employed in the seaming of stockings. Payment was very low, knitters were paid less than two shillings for a dozen (12) stockings. Two dozen (24) stockings would take fourteen hours to make. This was the equivalent of a full days work in the summertime, 6a.m. - 8p.m., and more in wintertime as stockingers could only work at the frames during daylight hours. Long hours of work and a long working week were accepted as normal for both adults and children. In 1844 there were 245 frames in Crich, a large number for a rural village. This indicates that there must have been many houses like this one, which still stands on Crich Common today. The knitting frames were originally invented by the Rev. William Lee of Calverton, Nottingham in 1589 and improved by Jedidiah Strutt in 1758. They have been described as the most complex machines in industrial use before the 18th century. They consisted of 3,500 different components which took 50 days to make and 12 days to assemble and so were very expensive. They were rented to the framework knitters who not only had to repair and maintain them in working order, but sometimes had to adapt them to produce different kinds of work. These adaptions could take several days to complete during which time there would be no output of work and therefore no income for the knitters. The framework knitters rented their frames from hosiers. The practice of charging the workers seems to have been a safeguard to make sure of a return on the considerable capital invested in the frames. It is likely that in Crich most were rented from hosiers in nearby Belper. In 1829 the largest hosiers in Belper were Messrs. Ward, Brettle & Ward, who rented out about 400 silk stocking frames and 2,500 cotton hose frames to stockingers in the town and outlying villages. Their factory in Belper was built in 1835 and at about that time 100,000 dozen pairs (1,200.000 pairs) of stockings were produced annually. The production of these stockings was done under shocking conditions. The framework knitters in the 18th and 19th centuries were considered to be amongst the poorest members of the community. They worked long hours at very fine work in badly ventilated rooms, which being crowded with frames, gave little room for movement. Many of them compensated for their hard working conditions and long working hours by excessive bouts of drinking at the week-end. With little money left to spend on food their general state of health was very poor. In a report in 1844 on the Conditions of Framework Knitters, the physical conditions of the people were said to be appalling. The children, ill fed and badly clothed were put to work by their parents as soon as they were able, the boys by winding and the girls to seaming sometimes as early as the age of 5 years. The work available seems to have fluctuated considerably owing to economic conditions, wars, etc., and when there was insufficient work, the framework knitters would be reduced to applying for relief. The Poor Law records of this time show that relief was paid to some in Crich and the census returns contain such entries as "pauper - framework knitter". Although the working conditions of the framework knitters were so appalling, their wages so low and their diet so poor that their physical health was frequently undermined they still developed a dogged independence and resisted change to other jobs. Some, like agricultural labouring, they could not do because of their poor health, others, like factory work they would not do because they were not prepared to adapt themselves to the discipline of working regular hours in a mill. Because they were so poor many parents could not afford to apprentice their children to other, better trades. The children were ill educated, many only went to Sunday School. In some, day schoolgirls were allowed to take seaming from home on afternoons as an encouragement to get them to attend. It was not until the Education Act of 1876 which made school attendance compulsory from 5-14years that these children were really free. In Crich during the middle of the 19th century there were 127 families, with 270 people involved in framework knitting, making cotton stockings. Many of these families lived in concentrated groups in various parts of the Parish, particularly around Crich Common and Fritchley, so that it is likely that the family living in Royal Oak Cottages, mentioned at the beginning of this article, would be very typical one of that time. Note: Mrs. D. M. Howarth of Alderwasley near Crich, the writer of this piece was, during her teaching career a teacher of Home Economics and Social Education.